Lots of towns hold a polar plunge fundraising event in the winter. Duluth, Minnesota’s version, where participants jump in Lake Superior every February, might just be the coldest. Comet Lovejoy’s a season behind, but sure enough, it’s following suit, diving deep into the dark waters of the north celestial pole this month. I dropped in on our old friend last night, when it glowed only 8° from the North Star. In 8×40 binoculars, the comet was faintly visible as a hazy blob of light with a brighter center. Not a sight to knock you over, but the fact that this comet is still visible in binoculars after so many months makes it worthwhile to seek out. Moonless skies for the next 10-11 nights means lots of opportunities. Unless a new comet is discovered, Lovejoy will continue to remain the only “bright” comet visible from mid-northern latitudes for some time. There’s a tiny chance Comet C/2014 Q1 PanSTARRS will wax bright enough to see in twilight in early July, but it will be very low in the northwestern sky at dusk and visible for a few nights at most. Only C/2013 US10 Catalina offers the chance for a naked eye / binocular appearance, when it re-emerges from the solar glare in the latter half of November in the morning sky. Southern hemisphere observers have more to smile about with Comet C/2015 G2 MASTER currently flaunting its fluff at magnitude +6.6 or just under the naked eye limit. They’ll also get a far better view of C/2014 Q1 PanSTARRS come this July and August. Through a telescope, Lovejoy still shows off a round, 6 arc minute diameter coma (one-fifth as wide as a full moon) and a denser, brighter core highlighted by a starlike false nucleus. We call it false because the true comet nucleus, probably no more than a few kilometers across, hides within a dusty cocoon of its own making. Only spacecraft have been able to get close enough for a clear view of comet nuclei. Each shows a unique and usually non-spherical shape because comets aren’t massive enough for their own self-gravity to crush them into spheres the way larger moons and planets do. If you’re a single object and big, being spherical comes naturally. In my 15-inch (37-cm) telescope a faint wisp of a tail poked from the coma to the north. Looking at the map, you can see the comet’s headed due north through Cepheus toward Polaris, the North Star. Each passing night, it draws closer to the sky’s celestial pivot point, missing it by just 1° on the evenings of May 27 and 28. 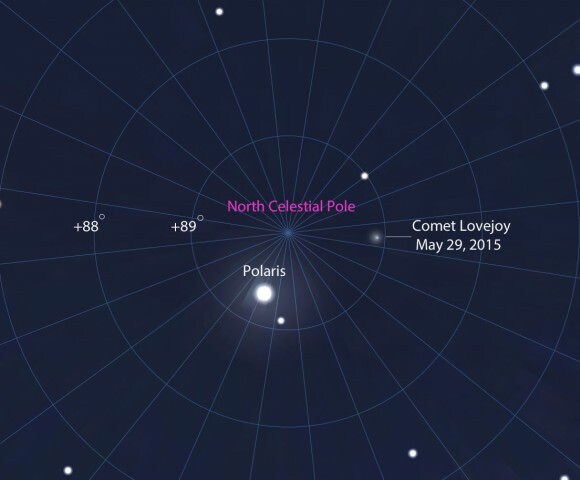 Closest approach to the north celestial pole, which marks the spot in the sky toward which Earth’s north polar axis currently points, occurs on May 29 with a separation of 54 arc minutes or just under a degree. Finding Polaris is easy. Just draw a line through the two stars at the end of of the Big Dipper’s Bowl toward the horizon. The first similarly bright star you run into is the North Star. Using the map, you can navigate from Polaris to the fuzzy comet with either binoculars or telescope. Next PostNext What Shape is the Universe?